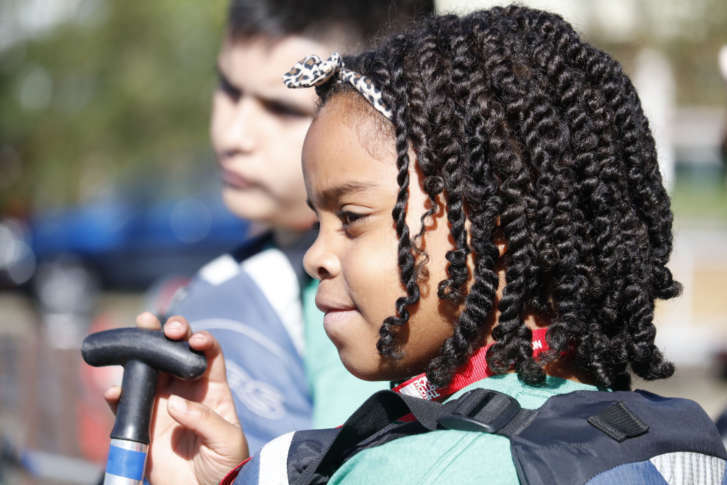 There's a national drive to get “Every Kid in a Park,” and on Tuesday that included taking 70 D.C. fourth-graders outside to paddle on the Potomac River. See photos and video. WASHINGTON — There’s a national drive on to get “Every Kid in a Park,” and on Tuesday that included taking 70 D.C. fourth-graders outside to paddle on the Potomac River. For some students, such as 9-year-old Samarah Malcolm from the Elsie Whitlow Stokes Community Freedom Public Charter School, this was not their first time in a canoe. On Tuesday, the students took off in a convoy of canoes, with bright sunshine sparkling on the Potomac River. Some students said they were nervous at first, but once they were bobbing in the boats, they took up their paddles and pointed out sights along the river from the Key Bridge to the Kennedy Center for the Performing Arts. Bobby Caballero, director of student support at the Stokes school, says the school has had a partnership with the National Park Trust that meshes with the school’s philosophy of helping kids learn outside the confines of a classroom. “We’re exposing kids to treasures that are right in their own backyard,” Caballero said. During Tuesday’s outing, the students were presented with free passes to all national parks, lands and waters for themselves and their families for a year.